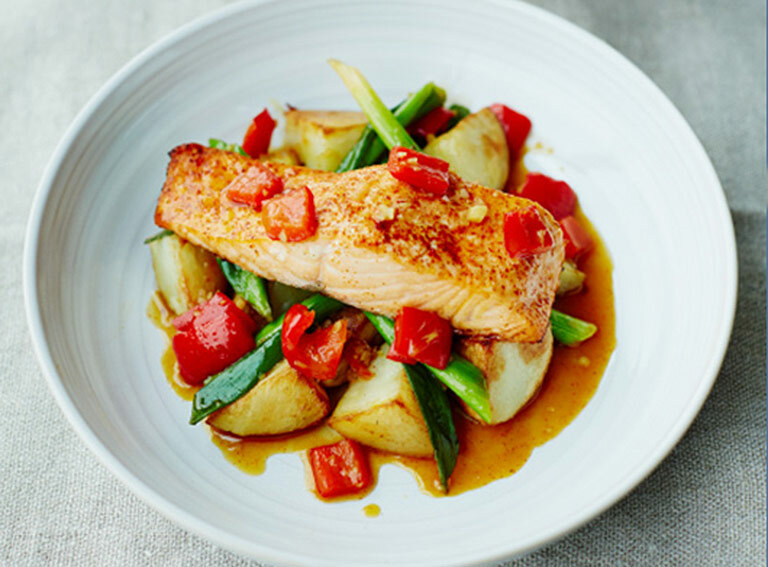 A quick and healthy salmon fillet recipe that's perfect for a midweek meal, especially as the relish can be made in bulk in advance. This brightly coloured and intensely flavoured recipe is speedy enough for any night of the week. The sweet and sour relish sets off the salmon beautifully and I’ve roasted the King Edwards in their skins to give the whole thing wholesome comfort,” writes chef Alex Mackay. 1. Pre-heat your oven to 200C /Gas 6 / Position upper middle shelf. Boil your kettle. 2. Get an oven tray with low sides. Spoon the vegetable oil onto it. Put the tray into the oven for 5 minutes to heat the oil. Add the King Edwards to the tray in a single layer, turn them in the oil to make sure they are fully coated. Roast for 20 minutes. Turn the King Edwards and baste them with a heat proof brush. Roast for 15 minutes more. 3. While the potatoes roast, prepare the red pepper relish. Get a 20-24cm frying or sauté pan that you have a lid for. Add the diced peppers, garlic, the olive oil and the water. Cover the pan and sweat over a medium heat for 6 minutes. Cut the spring onions lengthways into 3 on an angle. Slice the greenest top third finely then set the slices aside. Add the bottom two thirds to the peppers once they’ve sweated for 6 minutes. Sweat for a further 4 minutes. Add the orange juice and honey to the pan, boil until it has reduced by half. Turn off the heat. Season to taste with salt, cayenne pepper and sugar. You want it to be sweet, sour and a little spicy. 4. Once the potatoes have roasted for 35 minutes, check to see if they ready. If they are, push them onto one half of the tray. Season the salmon with salt, cayenne pepper and the orange zest. Brush the seasonings in well. Put the salmon on the tray with the potatoes. Roast for 6 minutes. 5. Transfer the salmon and King Edwards to plates. Stir the sliced spring onions into the relish. Spoon it over the salmon. The red pepper relish can easily be made a day ahead. Make double the relish. It’ll keep in the fridge for a couple of days and is good with everything from chicken to cheese to chips. Our thanks to The Potato Council for providing this recipe. Alex Mackay is a food correspondent for Saga Magazine. Read their latest articles.